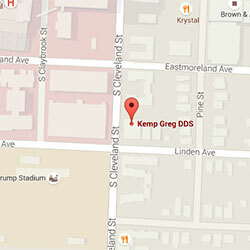 Serving the tri-state areas of Memphis, TN, Southaven, MS, and West Memphis, AR for more than 24 years, Dr. Greg Kemp and our team are here to see you smile! Our practice is committed to providing the highest caliber of comprehensive dental care for the entire family in a friendly and relax atmosphere. We are an exceptional team and we are excited about what we do. Through excellence in dentistry and quality relationships, we make a positive contribution to the oral health, happiness, and self-esteem of those around us. Excellence in everything is expected. We see patients from age three to 103, and always accept new patients. To hep you achieve a lifetime of oral health, we provide preventive oral hygiene, periodontal treatments, restorative care, cosmetic dentistry including full-mouth restoration, Philips Zoom! teeth whitening, and Invisalign® clear aligners. We’ve created a high-tech, patient-focused, welcoming environment, where our experienced team will spend time working with you to help you achieve the beautiful smile you’ve always wanted. Please contact our Memphis dental office to schedule an appointment with us today!